Bahia Basket (La Liga) landed 24-year old American forward Drew Martin (203-88kg-94, college: Concordia, OR, agency: Court Side). It is actually his comeback to Bahia Blanca as he has played here before. Martin played recently at Verdirrojo in Uruguayan LUB league. In 11 games he averaged impressive 19.5ppg, 9.1rpg, 2.8apg and 1.4spg this season. He was also selected League Player of the Week. 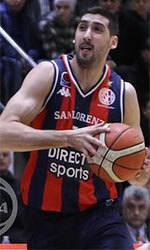 Martin also played for Bahia Basket earlier that season where in two LUB games he had just 2.0ppg, 4.5rpg and 1.5spg. Martin has played previously professionally in Japan (Tokyo Cinq Reves) and Luxembourg (Heffingen). He attended Concordia University, OR until 2017 and it is his second season in pro basketball.